Here is a selected list of Tony’s equipment, with some pictures and a few words about each. 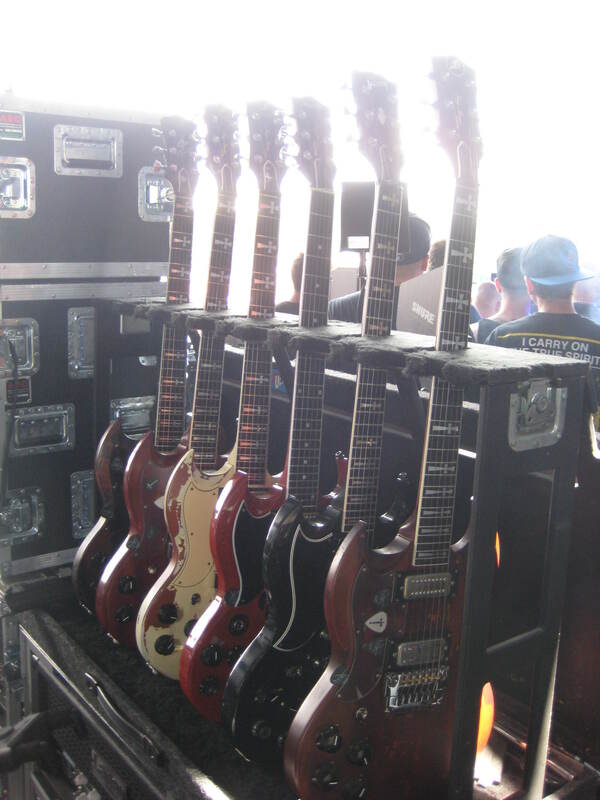 Black Gibson Custom Shop S.G.
Red Gibson Custom Shop S.G.
Tony’s Guitars on a rack during “13” tour. On the original 1996 sessions at the Cabin Studios in Coventry and Dep Studios in Birmingham, Tony used Gibson SG and Les Paul guitars, the Jaydee Custom SG, a Fender Telecaster in the ‘overstrung’ or ‘Nashville tuning’ mode, a Steinberger Transtrem guitar, a Gibson J50 acoustic and a Fender nylon strung classical guitar. Amplification was by Laney GH100TI amplifiers, a Laney VC30 amplifier, a Marshall 2554 amplifier and Laney speakers. Guitar effects were provided by a Peavey TubeFex unit. All guitar strings used were by La Bella. Glenn used a Fender Jazz bass and a Warwick bass. The bass amp was a Laney BC 120. The original 24 track 2” tapes were transferred to the digital ProTools format by Mike Exeter, who had engineered the DEP sessions. The 2004 drum sessions with Jim Copley were recorded at Tone Hall, Tony’s home studio. They were played on Yamaha drums and Zildjan cymbals. The studio gear used was ProTools LE on Digitech 002R, Mackie 32ch 8 bus desk, Mackie HUI control surface, Mackie HR824 & Yamaha NS10 monitor speakers. Computer power was by Apple Mac G4 dual processor tower and Powerbook and ibook laptop units. Signal processing was by Universal Audio 1176, DBX 160A, Klark Teknik 504 & 514, Midas XL42, Eventide HR3000DSE, Roland SDE 3000 &Yamaha SPX90. The album was recorded at Monnow Valley studios, just outside Monmouth in South Wales. The studio features a very large live room and a separate control room housing the SSL mixing desk, the Pro Tools computer system and the sound processing gear. 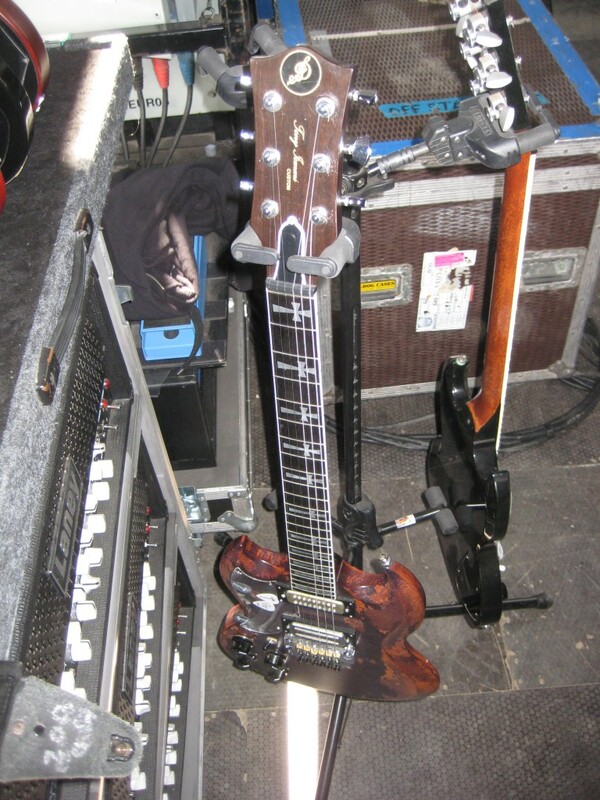 The same guitar gear set-up was used throughout the recording phase of the project. Three 4 x 12” cabinets, two Laney and one old Marshall, were placed side by side in the live room, separated by large acoustic baffles. The Laney cabs were loaded with the old HH 41211 drivers (very similar to the Celestion G12 75) and the Marshall with Celestion Vintage 30s. Each cab was miked by one Shure SM 57. The amps were set up in the control room. There were five amp heads stacked up, two Laney GH 100 TIs, one Laney TT 100, one Paul Reed Smith modified Marshall JCM 800 and one vintage Vox AC30 head. Also in the control room was a small M C Electrics effects board with full bypass switch. The guitar effects used were; Boss Over Drive, MXR Phase 90, AnalogMan Chorus, DOD Octave divider, Tycobrahe Parapedal wah, Ibanez flanger, Boss delay, Jim Dunlop Rotovibe, Jim Dunlop Univibe. The signal path was guitar into M C Electrics A/B switch (to allow routing to Korg rack tuner), into the bypass switch on the effects board, then into a Pete Cornish active splitter/ground-lift unit, then out to whichever combination of amps was being used and finally out to the cabinets via heavy gauge speaker cables. The recording can be split into 3 main phases: tracking, solos and overdubs. For tracking, most songs used the Laney TI100s and Marshall amp heads and a combination of Gibson Custom Shop Iommi model SGs and Les Pauls. Generally the SGs had lighter strings and the Les Pauls heavier. Different guitars were used as some songs were in D# and some down to C# with low strings sometimes going down to A#. 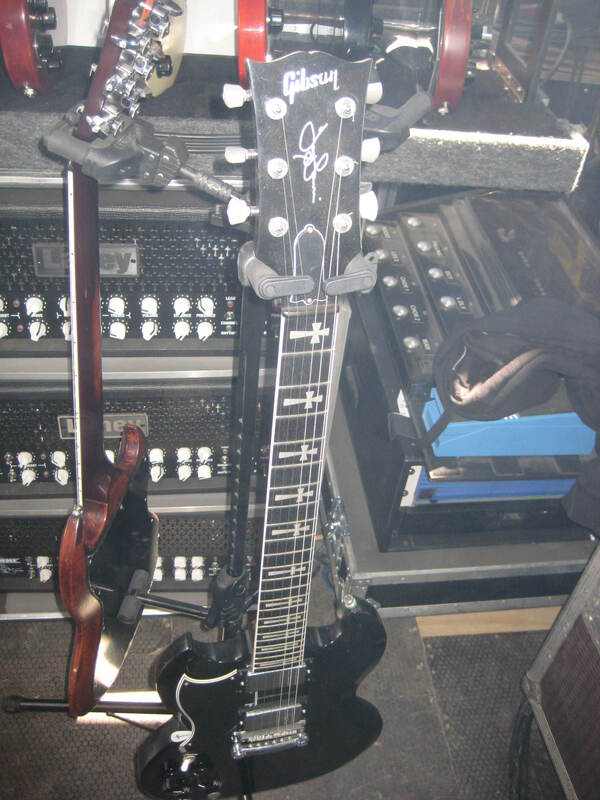 Most solos were played on the JayDee ‘Old Boy’ SG, though an Epiphone Iommi SG fitted with Gibson P94 pick-ups and a Fender American Deluxe Stratocaster were also used. These were played using the Laney TIs and the Marshall. The overdubs used a selection of the amps depending on the sound required. Cleaner bits used mostly the Vox head though some used the clean channel of the Laney TT100. This is where most of the modulation type effect units were used. Guitars used here were mostly the Iommi Custom Shop SGs, the P94 loaded Epiphone Iommi SG, a Fender Telecaster, a Fernandes Sustainer and the Strat. The acoustic parts were played on a Taylor 815L, a Gibson J 50 and an Epiphone PR 350CE. During the recording of 13 Tony used a combination of his new signature Laney TI100, an old Laney Klipp and a Laney Supergroup. The different amps were used to provide a left and right difference in the stereo mix. Various treble boosters and straight gain boosters were used to drivethe input of the cleaner channels which smoothed out the sound to get to a more vintage sound. The TI100 was absolutely brilliant in it’s versatility to create the sounds we were looking for. 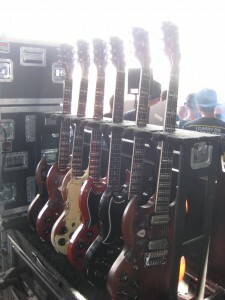 Most of the guitars used were custom built “New Boys” (replicas of Tony’s stalwart “Old Boy”) made by the original luthier John Diggings (Jaydee) along with a couple of his signature Gibson SG models. There were also some lovely Taylor acoustics which sound brilliant. The ever present Steinberger GM4T was used for clean parts – a very versatile guitar even though it looks a bit odd!! Ultimately the sound created was down to how Tony played. His setup is incredibly simple and, like most great guitarists, it comes from his fingers. Special thanks should go to Dave Hirons (TI100 designer), Mike Hill (Pedalboard Designer), Mike Clement (Long serving guitar technician) and Dave Barerra (USA based guitar technician). It takes a team to make a classic record like this!!! Below is Mike Clement, doing what he normally does during a gig. Mike is the bloke who is charged with keeping all of this up and running, and in prime condition. If it wasn’t for Mike, Tony wouldn’t be able to play on stage. Got the Epiphone Tony Iommi sig guitar a number of years ago. Absolutely love the guitar but have had to send a couple of them back to gibson/epiphone due to annoying problems. The first one I got the wood actually warped on the fret board, sent it back and they refunded me and claimed it was a factory dud. The second one I bought had problems right from the start including issues with a couple of the frets (not being able to bend the strings past a certain note without them catching on the fret and cutting out), the pick-ups discolouring and turning an ‘oily’ colour and the wood around the output socket collapsing. Again, sent this back for a refund and got yet another with the money I got back. This one has generally been OK but am now starting to get a lot of issues with faulty wiring and the tone nobs not working etc. The pick-ups have discoloured with this one too and am worried its just a matter of time before another major issue surfaces. A mate of mine who has the Gibson version has never had these sort of problems so its obviously Epiphone! Know a lot of people will say you get what you pay for etc but when spending the guts of £500 on a guitar you expect it to last over a year without any problems! Has anyone else had problems with the Epiphone version of this guitar? Its a real shame because its a brilliant guitar with a great sound just wish it was a bit more sturdy like its Gibson counterpart. Where are you buying your “Epiphones” from? Sound like counterfeits to me. Literally the only problems I’ve experienced with mine, purchased at Gibson in Nashville, Tennessee is the control pots breaking down over time, which I replaced with new CTS pots & no more problems. And yes, the black finish on the black chrome items like the bridge & pickups tend to fade over time. This is probably a big reason why Gibson went with regular chrome, but I assure you the pickups in the Epi ARE true Gibson USA Iommi Signature Humbuckers. I would suggest you go here: http://www.guitardaterproject.org/epiphone.aspx and check your serial number. Although, of course, a lot of the Oriental counterfeiters just copy the serials along with the guitars anyway. But I have a few Epiphones, while they’re not as high quality as Gibson originals I have NO problems with any of them like you describe. Bought the first guitar from a reputable guitar shop in Northern Ireland, the second from http://www.gak.co.uk and the third from a guitar shop in Edinburgh. Just bad luck I guess!!! I think so,it’s really a bad luck! though Epiphone got a minor problems with it’s guitars especially the ones produced in China,but the Indonesian and Korean generally are better. The G400 pro. is an awesome guitar, I have 2 plus the worn cherry version. all from GAK, Never had a moments problem with any of them !! Signature guitars always seem to have problems unless you buy the real deal. Unfortunately not all of us has the 46 squillion dollars to pay for it. I have owned Gibson SG’s as well and the quality of the Epi, is worth the money, the Gibsons are not. Just tooooo much money for a basic well made guitar and a NAME. I have also owned many Ibanez’s through the years from Original 83 Roadstars up to contemporary guitars. Not ONCE have I ever had any problems. So it CAN be done !! Hi Tony. I have seen you live 4 times with sabbath, and its always mazing. I play for 42 years and getting that sound that comes of the strings with the plastic tips is impossible. I saw a no name guitarist in 1776 at the Garden who opened up for you named Van Halen. When the show was over I realized the riff I was singing in my head for from Hole in the Sky. Keep rockin. I have been a Sabbath fan since they started, seen them live at least 40 x. I am currently in Gdansk Poland and visited the newly opened Hard Rock Cafe, which prominently displays a gold sunburst left-hand Gibson Les Paul (signed by Tony). I have never personally seen this guitar in any concert but I have seen a short video from the Never Say Die era with Tony playing a Les Paul. The difference between the video and the one in Gdansk is the rhythm pick-ups. Any reliable information on the one in Gdansk would be greatly appreciated! Thanks! I’ve been a Black Sabbath fan for a long time and I play guitar for about 32 years. Sign of the Southern Cross is one of my favorite songs. I’m still trying to figure out how Tony got that guitar tone. Anyone? Chorus? Uni Vibe? extra light strings, tuned a half step down, and played through a bass amp. I think I read that somewhere. I may be wrong. I’ve managed to get a pretty accurate live tone with a fender mustang and a boss DS-1 (Sounds crazy I know but hear me out) just dial your amp EQ to ten for high mids and lows, tune to halfstep for anything later than paranoid and dial the DS-1 eq to all the way down for tone, gain all the way up and level all the way up, it will feedback quite a bit mind you but the heavier sounding songs sound perfect. The Boss DS-1 isn’t even needed. The Mustang itself nails Iommi-like sounds very well. Harald , have you tried emailing Mike Clement, Tony’s guitar tech ? he may have an answer for you ? Hope this helped ? Do you have an email adres of Mike Clement, Chad Hallman? I can’t seem to find it anywhere. What pot-meters does he use? 500K? 1M? Thanks for this wonderful post. I like it so much. It just bring me back to the time when I attended one of their concert! It’s amazing and I will never forget that for my whole life. Been listening to the mighty Black Sabbath since i was 10 when my best friend gave me the Reunion album on CASSETTE. I must have played that thing a million times! I started playing guitar 4 years later and have now been playing for 13 years and still have no clue how Tony gets that MASSIVE tone from! Even after all the crazy changes that heavy music and heavy guitar has gone through in the past 45 years no guitar cuts through like Tony’s! Been a Black Sabbath / Tony fan since my brother brought back the album Paranoid from Germany when he was in the Army. I found out much later that Tony played left handed, and was missing a finger. Found out just days ago, that he is actually missing two fingers, and the machine he lost them on. I started playing guitar when I was 17 right handed. I use to work as a carpenter in a cabinet shop. At age 27 I lost the pointer finger on my left hand to a machine. Thought I would never play again. About 5 years later a friend that played suggested that I get a left handed guitar, and at least try. Purchased a $75.00 finger hut guitar, strung it left handed, and gave it a try. I’m 46 now, and play better left handed now then I did as a kid right handed. To anyone out there, don’t give up. It can be done. Would love to have a lefty custom shop SG. Just way out of my price range. I have been listening to Sabbath since 1974 and play an SG because of it. The equipment you use is part of the sound. But most of the sound comes from who you are as a person and what you think of while playing. During the solo by Tony for Born Again the universe blasted into atoms them I went into a river of atoms dived into one of these atoms and was back at the show. Thank you for whatever you were thinking Tony you are a true gentleman. Just purchased the Epiphone SG Tony Iommi in left hand. I have two bad fingers on my left hand, but switched to playing left handed. This makes your story fascinating! I have been a fen since we would ride around in my 1965 chev hippy van listing to Black Sabbath! Keep rocking! Do you have any idea what kind of pedals Tony uses during the solos? The solo sound which I’m looking for is for example in Fused or in The DEP Sessions albums? Does Tony Iommi still use the Treble Booster? I’ve got the Laney TI 15-112, and wonder if I should get a Treble Booster like Tony Iommi used in the past. I also have the TI15-112 – just purchased it a few weeks ago. I play a ’75 Gibson SG with Iommi bridge Gibson pick-up. I have a Ibanez Tube-screamer pedal with the tone knob at almost zero. I turn-off the amps built-in Boost and stomp that Boost ON when playing Leads. Sounds very good. (foot switch FS1 by Laney – not expensive). Remember to turn down the Tone control knobs on you amp and guitar also. I love the Black Sabbath and nonetheless i/m a big fan for a long time. Playing guitar for over 10 years 🙂 Simply in love with my passion. I Love my Laney pushed by Ampeg Head. I can rip many thousands with this. My guitar of choice would be the SG Supreme in Emerald Green!!! What a kKiller Guitar!!! My set up is a Gibson 1981 SG standard that goes into a Crybaby Wah-wah. From there into a rack mount Real Tube 2 preamp into a Digitech 2120 into two Red knob Fender Twins on top of two Marshall 4×12’s. Massive sound. I have a Gibson Custom Shop Iommi Dark Heritage Cherry, Gibson Iommi Artist series Black, Gibson 2011 SG Special with P-90’s Red Monkey Replica, Jay Dee Iommi SG Custom Cherry and Walnut, Epiphone SG P-94 Iommi, Epiphone Iommi SG , And of Course The New Epiphone Iommi SG, They All Sound Great Through my Laney TI 100 Head and Matching Cab. The Jay Dee really stands alone. Areal Tone Monster. We have a black sabbath cover band here in Brazil and would like the master Tony Iommi blessing. In facebook page has the presentation video. We will compete in the 2017 convention, but would like recognition here of Brazil as Black Sabbath cover Brazil . Thank you in advance . What about the modulation he used on Heavne and Hell and later recordings? No one ever talks about that. Seventh Star solos for instance. No one has mentioned that in the studio, Tony overdubs his guitar tracks quite a bit. That can certainly play a role in creating such a massive sound. One thing you can do live is to play through 2 amps via an a/b switch. Been a fan since the great days and time period that was 1972. How time passes. I took delivery of your Epiphone SG Limited almost two weeks ago and wanted to thank you for working with Gibson & Epiphone in making this killer guitar. Granted I’m still just an amateur on my best day, but this SG with your pick ups makes me sound better than I deserve! I punish a new Vox VT40X modeling amp quite often. When I toast the Vox, I’ll buy your autographed Laney. Peace to you and yours, Brother Iommi. I just bought an Orange Rocker 15 since Laney amps aren’t available in my country. It works quite well in recreating a Black Sabbath sound from the early years. The settings must include full gain and bass and no mids. Another bonus on this amp is the power switch located inside on the chassis that brings down the power to 0.5W . Extra sustain can be obtained with either a power booster like the cheap EH LPB-1 or for solos with the EH Screaming Bird treble booster. What equipment was used in the album “Heaven and Hell”? I would like to know what are Tony’s thoughts on the Epiphone SG Prophecy series produced about 9 years ago? Back then there were the Tony Iommi G400 series Epiphones and I’ve heard hit or miss stories about those Signature G400’s Epiphone. I almost came close to trading my then restock SG Prophecy GX ( the burgundy red ones with Gibson USA Dirty Fingers pickups) towards a used G400 Signature Iommi model I saw used at a then local Guitar Center store but was talked out of it by a so called friend of mine. What a loss. They come used every now and then on Musicgoround and ebay and now we have the Epiphone Iommi SG Custom currently in production. I like the Korean made Signature G400’s better for some reason but if push comes to shove I might buy me the new Iommi SG Custom by Epiphone in the near future. I currently own a Gibson SG Melody Maker in black in like new condition I bought used at a mom and pop store in NC and currently paying on a used Epiphone SG Prophecy GX like the one I had in 2009 and a vintage Japanese version of a Xaviere XV300 SG thats about as old as I am ( I will be 40 this year 2017). The Xaviere is pre GFS and made in Japan as stated before and not Chinese like the current ones are. I am using a bugera infinium amp and cab and its been a bit hard figuring how to get iommi’s tone from it. I am using his sig epi g400 pro as well as a Gibson les paul. any hint on where my setting should be? I’m watching the Angelic Sessions from the new The End dvd, & at 16:50, just before Tomorrow’s Dream, Tony sprays something on the fretboard. What is that spray? I like to know too. No ideas? The spray is Finger Ease. It’s a lubricant that allows the fingers to slide a little easier and keeps the squeaking noises down. It’s kinda citrus smelling too and I think that helps harden the callouses a little. Hello, been a fan from 1982, have the new Epiphone signature and have the SG400 Iommi just painted cherry and was wondering, does Tony uses his pickups with split wiring? Thank you. Hello, I write for Guitars Exchange magazine, and many of my articles are republished in top Spanish newspapers like ‘Marca’ and ‘El Mundo’. I was wondering if it might be possible to arrange a telephone interview with Tony Iommi? Would love to restore Cozy Powell drums and put them in a museum. I think Tommi has them. 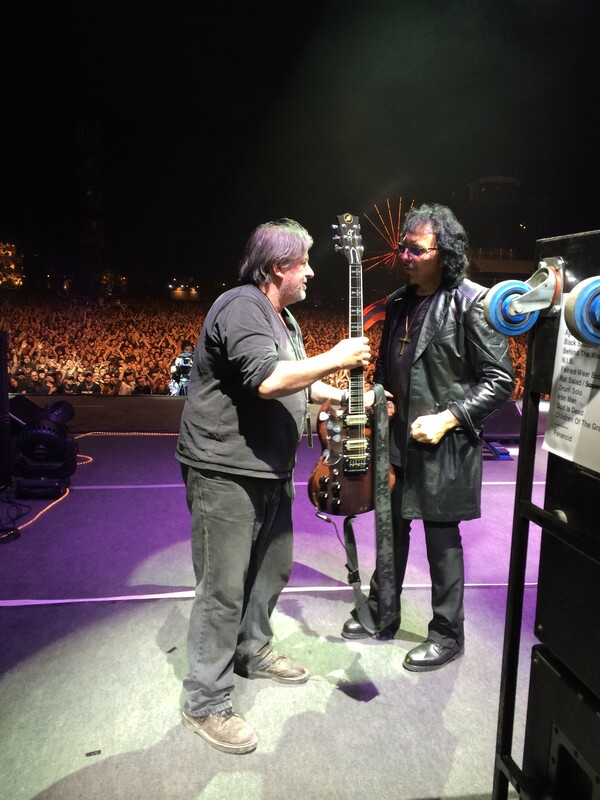 Is it possible to have the manufacturiers info on Mr.Iommi’s prosthetic tips. I am desperately seeking and praying for help. My ring finger tip has been removed in an accident. Does anyone know how to get that robot-voice on Iron Man? Some people say it’s an EHX Bad Stone or a Ring Modulator.